Great analysis as always. What gets me is how often I still hear from journalists, "Oh, it's just a cyclical decline due to the economy." That's beyond delusional. Fortunately, it's time for me to stop worrying about people trying to migrate to the present. I'm now solely focused on the future. It's far too late to saw most traditional journalists and journalism organizations. Read the comments by the San Francisco Chronicle's publisher about his paper's 25 percent drop in circulation (gulp) and you see that these circulation declines are all part of a deliberate and clever new business plan. If you believe that, I know a former New York investment guru named Bernie who has some suggestions for investing your money. The trouble is, Alan, that you have been writing this column for the last two years I have been reading you. And there is no new business plan anywhere on the horizon. One point I think you should make is the generational differences concerning newspaper reading. Look around any college campus and you will be hard-pressed to find someone reading a newspaper. The younger generation doesn't want anything to do with newspapers, and have alternatives to finding what is going on and where the parties are that older generations never dreamed of. The generation of newspaper readers is dying off. Perhaps a zombie newsman would be a good costume for Halloween this year. I see the zombie look every time my husband makes it through another round of layoffs at his paper. Time for a change I guess. Alan, having spent over 40 years around the newspaper business, it's the concentration of ownership into few hands that is killing the newspapers, and this is by design. You state that the decline has been for two decades, but the consolidation of ownership has taken place for over three decades. The perfect example was American City Business Journals. In the early 80s, ACBJ challenged the gatekeeper role of the dailies, which didn't write much about business. Honest news resulted in them being highly successful and much appreciated by readers. Then in the late 80s, they were taken private by folks from Dow Jones. A few years later, they were sold to Advance Newspapers (Newhouse). So now they're part of the same plantation as many dailies, in the SAME cities. Journalism was replaced by marketing. More ads, less controversy. Why is there little investigative reporting, by those who see dots every day and then start to connect them? Look up Gary Webb in Wikipedia. You say too much, get awards, then you no longer work anywhere, due to government and financial influences over the planatation owners. If these owners didn't want to keep the masses ignorant, real news would be printed and real people would buy newspapers. They must not allow this to happen. Sociopaths in high places would then be found out and lose their power and influence. It really is that simple. One cannot steal without first lying. An honest and free press could point that out. Since they are not free, and don't publish these things, there's simply little reason to buy a newspaper. The owners have converted the dailies into mass-advertising delivery systems, distributing flyers from companies owned by the same major holders of the newspaper chains. Sad to say. Given that newspapers have about 10 more years left, it's certainly time for their transition strategies to be rolled out. Some places, such as Detroit, have done that. It's sad but true; now the problem for a democracy is to reach voting adults with unbiased journalism produced by trained professional journalists. Many newspaper publisher have substituted inflated print circulation numbers with inflated newspaper website numbers, driven by contests and cleavage. Same story, different medium - with the same result. Advertisers want to know who is looking, how hard and for how long. What I find funny are the amount of newspapers who didn't see the writing on the wall, and are now bleeding a slow death. They continue to layoff workers and increase rates, but that will only delay the inevitable. Another side of the story are the ad agencies who's bread and butter is newspaper/print advertising. A couple years ago, I worked for a print media agency owned by omnicom. For years, employees told upper management that we needed to branch out into web advertising, and offer our clients a broader range of services. After years of denial, they finally made the jump, or should I say, stuck their toe in the water, but it was too late. Now, I get little tidbits here and there from current and former employees, and just like the newspapers that fed them for years, they are laying off people and cutting back on expenses to keep afloat. Sad to say, but it won't be long until they are no longer around. Most newspapers/journalists didn't see or understand the factors that changed their own business environment. Imagine, then, how ignorant they were of the people and events they "reported". I agree with everything in your post, except the argument that advertisers aren't interested in mass. One of the challenges of even the largest newspaper sites is that they are dwarfed by the size of the audiences offered by both the portals and the huge ad networks like 24/7 Real Media. And these mass outlets for advertisers charge a much lower CPM than the newspaper (or magazine) sites. Plus, the digital ad agencies, which have far fewer media buyers than the traditional agencies, prefer the cheaper, one-stop shopping these more mass ad outlets provide. So, yes, you're right. Newspapers are no longer a mass medium. But advertisers are still demanding mass audiences in a "click or die" environment. Sometimes I pick up a newspaper just to kick 'old school'. This trend is definitely not new. I worked my way through college at a newspaper from 1979-83, and as an extra credit project for my Marketing 101 class, I wrote a paper about how eventually technology would kill the inefficient newspapers. Back then Compuserv and Videotex http://en.wikipedia.org/wiki/Videotex were all the rage. Obviously, it took a long time for the Internet to take over, but now of course, it has. Alan, can you explain a bit more about how in some years, there's more papers than actual households. Is this reflecting people who shared papers? I'm a new media junkie and producer. I'm 41 years old. I don't read newspapers because they are stuck in the past- they don't change. "This font is classic." "This is the inverted pyramid." "But EVERY paper needs to be broken up into the same type of sections." The old guard got old, and too guarded. The walls are being torn down, and it's their own fault for thinking that the people ONLY wanted the brand of, 'Professional Journalism' the newspapers were selling. Sorry, but I'd like something different from what my father read, thank you very much. I am old enough to remember getting a morning paper and an afternoon paper. When I was a kid, I even delivered an afternoon paper for a couple years. 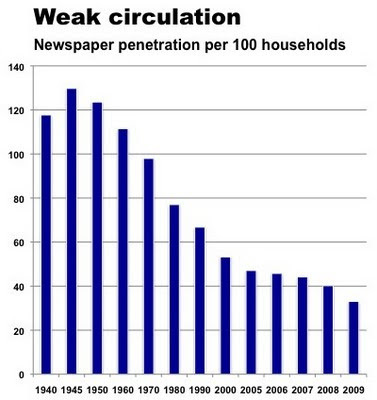 So that accounts for more than 100 newspapers per 100 households. I do not know if the newspapers would still be in this mess if they'd maintained their traditional identities. But I know I would have continued as a subscriber to the San Diego Union-Tribune if it had not farmed out its front page to the New York Times, and its editorial page to a squishy leftwing political philosophy. And it did not even have the honesty to take the "Union" (meaning Republican since 1860) off the masthead.